We’ve had a very unsettled Spring this year and with Summer supposedly just around the corner it’s strange that we’re still in winter pyjamas, with extra blankets on the beds, sometimes even having the heaters on although the last week has been a bit warmer. It’s been rain, rain and more rain with crazy winds causing havoc around the countryside. A sure sign of Spring is all the gorgeous lambs frolicking around the countryside as well as the Asparagus in-store. 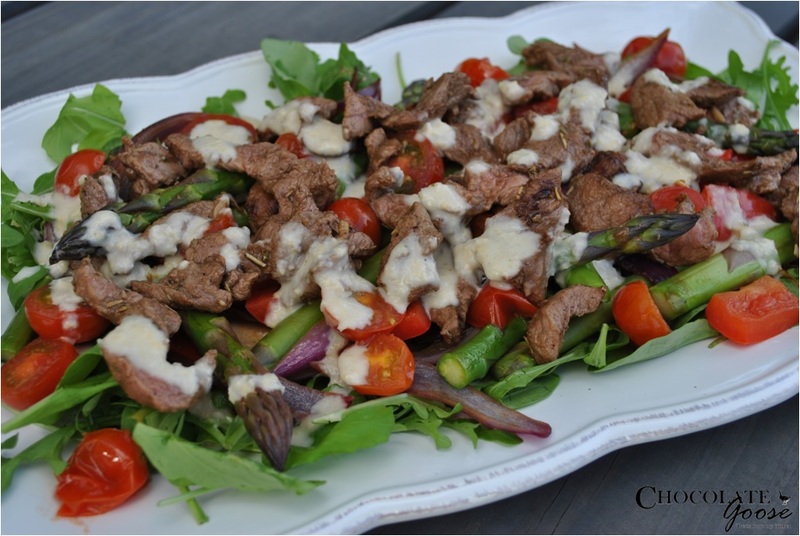 I love Asparagus and it works perfectly with the lamb in this salad. A few weekends ago the sun managed to break through and we had a glorious couple of days to walk along the beach, get into the garden to do some long overdo chores and were even able to fire up the braai again but my husband’s marinade recipe will have to wait to be shared another day as I have something I’d like to share with you first. It just looks like Spring on a plate and was absolutely delicious. I’ll definitely be making this again and hope that you will too. A great weekend light meal or an easy one for week nights. Not even 20 minutes and a delicious healthy meal was ready to serve. New Zealand is world renown for it’s delicious and healthy lamb and takes great pride in it’s distinctive flavour due to it being naturally raised on our country’s beautiful green pastures. When we moved here we noticed how different the meat tastes in comparison with homegrown South African Karoo lamb, they’re both delicious so I guess we’ve been very lucky with the produce from our two “home” countries. Combine garlic, rosemary and oil in a shallow bowl. Add the lamb and turn to coat the meat thoroughly. Cover and set aside in the fridge for at least 15 minutes to marinate. Preheat an oiled BBQ flatplate over moderately high heat or just do this on the stove top if you don’t have a BBQ or are not really in the mood. Add the lamb to the flatplate and stir-fry for 2 – 3 minutes until just cooked. Don’t overcook as the meat will continue to cook for a few minutes after you’ve removed it from the heat and as it is in thin strips, it may become tough. Set aside but keep warm (covering with tin foil is a good idea). Spray the onion, capsicum, tomatoes and asparagus with oil then char-grill the vegetables in batches, turning occasionally. Should take about 4 – 5 minutes but check, the veggies should still have a crunch to them, not be overcooked and soft. Spread the rocket or kale leaves onto a platter and arrange the vegetables on top. Top with the lamb and drizzle with the hummus dressing. Serve with lemon wedges.